What are those numbers by the side of the motorway and what are they for? Using Location Reference Markings and Emergency Roadside Telephones. IF YOU BREAK down on the motorway or need to report an incident it is important that you know your exact location so the emergency services can promptly reach you. To help pinpoint exactly where you are, there are Location Reference Indicator (LRI) signs and Location Reference Markings (LRMs) along the sides of motorways and dual carriageways. In the event of an incident or breakdown, the road user can relay the information contained on the LRI sign or LRM to inform emergency services exactly where the incident or breakdown has occurred. What do the signs tell you? First line: this is the name of the road you’re travelling on, e.g. M7. Second line: this is the direction you’re travelling in, e.g. ‘E’ indicates you are travelling eastbound. Third line: this is the distance in kilometres from the start of the motorway or dual carriageway, e.g. 32.5 shows your are 32.5km from the start of the route. So a sign reading M7, E, 32.5 means you are on the M7 heading in an eastbound direction 32.5km from the start of the motorway. 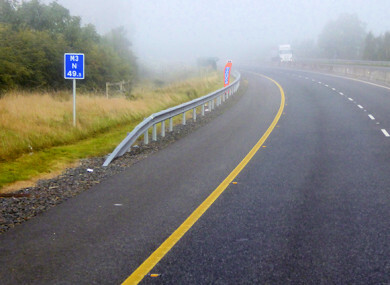 These signs supplement the LRI signs and are painted in the hard shoulder parallel to the road, every 100 metres. The LRM indicates the route and the direction of travel along with distance from the start of the route. The LRMs also indicate the direction to the nearest emergency telephone. What is an Emergency Roadside Telephone (ERT)? These phones are specifically provided for making calls to emergency services. There are nearly 1,400 ERTs installed on all major routes, which are managed from the Motorway Traffic Control Centre. They are located 1.6km apart and the control centre is manned 24hrs a day, 365 days of the year. When you call for help, make sure you tell the emergency services the information on the nearest LRI or LRM so they know exactly where you are. If you do need to use the ERT make sure you walk to the one located on your side of the carriageway. Also, if you are driving get someone else to place the call or use handsfree calling. You need to make sure you keep safe whilst reporting an incident. Email “What are those numbers by the side of the motorway and what are they for?”. Feedback on “What are those numbers by the side of the motorway and what are they for?”.